This guest blog was provided by James Young. He has extensive experience as an interior designer. He also enjoys sharing his design ideas online through blogging. If you’ve got cabinets from 20 years ago, a kitchen table that is on its last legs, or the colors on your walls are faded, perhaps your kitchen’s a little outdated. So what do you do? It’s time to refurbish, but you don’t have to gut and remodel; some of the best updates are also the simplest. Older kitchens use metals that were popular at the time in which they were built. Metal itself is still popular, but the designs have been updated significantly, even from ten years ago. Take a look at the new brushed aluminium, stainless steel, copper, and even nickel finishes. These make great cabinets, hardware, lighting accents, and even hood ranges. In the past, linoleum was used because it was a cheap and cheerful solution to flooring. Today, however, they make floors look a little dingy. The problem with cheap materials is that you get what you pay for; they tend not to hold up well over time, and they look like a cheap imitation of something else. These days, top designers are returning to natural wood flooring, stone, or tile. These materials are more resilient and will boost the value of your home. More recently, manufacturers have been able to come up with ceramic tiles that mimic hard wood – making it a lower cost option than sourcing the real deal. Travertine and slate are also suitable options. If you’re like most people, your kitchen gets a lot of traffic, but you don’t really have a way to accommodate people in the space you’re working with. If you want to modernize an old kitchen, consider bringing the dining room into the kitchen. If you can’t do that, try to find chairs in the same set as your dining room furniture and adding those pieces around a center island or counter space. Your old appliances probably use up a lot of energy. With electric and gas prices rising, you don’t want to be on the wrong end of that equation. That often means updating inefficient appliances and getting newer ones that can dramatically cut down on your energy usage. New lights in your kitchen can also update the space dramatically. While recessed lights used to be exclusive in this space, more modern designs employ a mix of recessed lights and non-directional lighting. Some kitchens can benefit from pendant lighting too. It all depends on the layout of your kitchen. You can take some great ideas from companies like Betta Living when it comes to lighting up your eating space. Entertaining guests? Maybe you need dimmers in here. Want a low-light option for midnight snacking and entertaining? Maybe you need low-hanging pendant lighting. Want bright, sun-like, lighting when you’re cooking? Maybe you could benefit from bright lights shining in all directions. The possibilities are endless. At the recent buying group conferences I attended, one of the primary topics of conversation was SEO – yes, Search Engine Optimization! As a known commodity and trusted industry marketer, my opinion was sought – What did I think about strategy “a”; tactic “b”; and what do I know about company “c”? I soon found industry professionals are being pummeled from all sides by companies looking to become their SEO vendor. And it’s not that you, as kitchen & bath industry professionals, don’t want to engage a company, it’s just that you don’t know the differences, you don’t know who to trust, and in many cases, you don’t even know the questions to ask to be able to make an informed decision. You don’t know what you don’t know! You [think you] know you need to dedicate resources to SEO (and digital branding) but with money tight, what’s the best investment? Don’t try to beat the house! Google is still king (70% of search engine visits) and they make and change the rules at their own discretion. There have been 14 algorithm changes so far in 2013 influencing how sites are ranked in searches. However, according to Google, with each change they strive to make the users’ experiences easier and more effective. Therefore, if I Google “kitchen design”, Google wants to be sure I get results [that send me to pages] from my geographic area (based on my ISP – Internet Service Provider) where kitchen design is the primary topic. To the kitchen and bath professional that means if “kitchen design” is how you want to be found by potential clients, you should have a page in your website dedicated to discussing “kitchen design”. If your client lands on a generic page keyword-stuffed with “kitchen design” a) they will “bounce” away and b) you’ll likely loose “Google juice” in a future Google algorithm update. 1 – Your site is structurally sound – straight-forward navigation, proper nomenclature, effective and efficient code. 2 – Your page and blog content is well thought-out, informative and useful. Remember that the information you provide needs to be the information your potential clients expect – on their first click. You only have one opportunity to make a winning first impression! Consider your own searches. If you perform a search for a “cardiologist” and the first page you click to has generic medical information with a long list of specialists, you’ll likely click the back button and move on! What do your potential clients see when they click through to your site? SEO is an evolving process/specialty/marketing tactic, with no guarantees. But there are effective ways to approach the challenge. I am happy to talk with anyone who may be confused and wants a clearer understanding. Contact me for your consultation –no sales pitch – promise. This blog post was provided to the Kitchen & Bath Channel by Alan Fraser, a blogger who prefers writing about what he does best – home improvement projects. Window coverings are more than just a decorative touch: they provide privacy, control the amount of natural light in a room and, according to Energy.gov, the right treatments reduce household energy use. A bare kitchen window may be the perfect place for temperature-controlled air to escape from your home and drive up energy bills. What window treatment is best for your kitchen window? Curtains, Shades or Blinds – What’s Best? For energy conservation, heavy, lined draperies are the best interior window covering, but drapes aren’t so practical for a kitchen window. Cloth absorbs grease and may hold on to strong kitchen odors, requiring frequent washing and replacement. Slatted blinds are convenient for controlling light, and they are an excellent choice for reducing summer heat, especially metallic blinds that reflect sunlight away from the window. But Living Green Magazine reports that roller shades are efficient at blocking harsh summer sunlight and preventing heat loss in the winter if they’re mounted and fitted properly. If the words “stylish” and “trendy” don’t pop into your head when you think about a roller shade, it may be time to think again. While they’re still practical, competitively priced and easy to install, today’s roller shades also offer style. For example, many companies stock roller shades in a variety of colors and finishes, including contemporary grasscloth. And for those who really need to block strong summer light, you can find Sunscreen solar shades which protect against the harsh UV rays that fade interior furnishings. Roller shades are versatile when it comes to style. They are simple, clean and fit well in a minimalist décor — straight lines without any fuss. If you prefer a more elegant look, consider topping off a decorative roller shade with a fabric-covered cornice. A cornice is a stationary treatment made from wood, covered in cloth and permanently attached to the top of the window. If your kitchen style is more traditional, a set of light, colorful curtains hung over the shade can add a needed pop of color and character. With so many styles and colors of roller shades to choose from, it’s easy to find one that will complement your decorative style. Unlike some other window treatments, shades can be wiped down without removing them from the window, and you can easily control light and privacy by rolling the shade up or down. 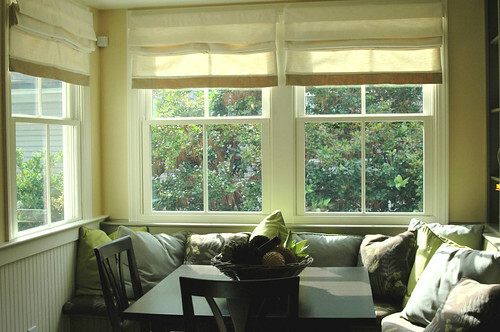 Or if you prefer, install shades that provide outdoor visibility even when drawn but shield the interior view. Shades are simple to operate — no hooks or rods or knotted-up strings to pull — and in the kitchen your busy hands will appreciate that ease of use. For the ultimate energy savings, each window in your home should properly caulked and weatherized. Those who live in areas with extreme weather should consider outdoor coverings like storm windows, shutters and overhangs. But when it comes to a home’s interior, an uncovered window is the utility company’s best friend. Roller shades provide year-round weather protection without sacrificing the charm or convenience every kitchen needs. The Kitchen & Bath Channel welcomes guest blogger Charlotte Stafford. She is a freelance writer who is obsessed with anything Interior Design related. She is constantly striving to learn more, use different styles and can usually be found experimenting in her own home! Sharing a meal is often the only time many families are all in the same place at the same time, and it is a great time to connect and catch up. A meal around a table is the perfect time and place to recharge batteries, talk, laugh and relax with people who probably know us better than we know ourselves. An open plan room design is definitely the way to go these days. Gone are the days of sectioning a house off, creating lots of little rooms. The open plan makes the best use of space, helps to create a light, airy environment and of course, is perfect for keeping people together. Some people find that when they have a dining room, it often goes unused. In these days of eating dinner whilst watching TV, the dining room is often only put into use for big occasions, such as dinner parties and family get-togethers. It is a shame to waste such valuable space, and knocking the wall down between a dining room and a kitchen makes much better use of it. Knocking down a main wall should not be undertaken lightly. If it is a substantial one, chances are it is a supporting wall and knocking this down without shoring it up could result in the entire top floor of the home crashing down to the ground. It might also be necessary to check to make sure what kinds of permits are required for these types of home renovations. Although not recommended, if the wall is going to be removed as part of a DIY project, there are some essential safety procedures to carry out. Most importantly, be sure the electricity is disconnected in the section of wall coming down. If the wall is made of brick, then wear a mask to stop the brick dust being breathed in. Always use the correct tools for the job in hand. Once the wall is gone, it is time to plan the kitchen layout. One section that seems to be an essential is a central island or station. An island serves many functions. It serves to break the combined spaces up and creates zones. Removing the wall will result in the loss of kitchen storage units, so an island also replaces that much needed storage space. Lastly, it creates a focal point, a center for congregation, which is the main point of a kitchen/diner. Chances are the new area is going to see a lot of foot traffic, so it would be better to have a tough, durable material on the floor, such as wood or laminate flooring. While the whole idea is to make two rooms into one, it is a good idea to keep the cooking and eating areas defined by subtly altering the coloring scheme. For example, use a light shade of color in the kitchen, and match it with a slightly darker shade of the same color in the dining area. The dining zone should look a little more opulent than the kitchen area; so go for some high quality furniture, such as an oak dining table, and matching, upholstered chairs. Hang an elaborate chandelier over the table to really help define the area. As you read this week’s email and blog posting, I’ll be on my drive from Chapel Hill to St. Louis for the annual BKBG Conference. Yes, you read correctly, I am making the (according to Google Maps) 11 hour and 46 minute drive across the Appalachians and Mississippi River to the Arch. I have found that between airport parking and security, layovers, cancelled flights and paying for baggage (except Southwest – thank you! ), if I can make the drive in 13 hours or less, you’ll find me with the sun roof open and SiriusXM blaring. There is another selfish reason… I love the “windshield time”! It gives me creative time, time to think about my business and my clients’ businesses. I find it both therapeutic and beneficial. What – what is your business? Define it. You are more than a “kitchen and bath designer” or “remodeler” – there are dozens of those in your market… just look around at your next NKBA, NARI or HBA meeting. What is it that makes you special and differentiates you from everyone else at the meeting? Credentials? Accreditations? Target Market? Skill Set? Take an honest look at yourself and your business and determine (or develop) your USP – Unique Selling Proposition. Where – once you determine your Unique Selling Proposition, you better let people outside your small circle of friends know about it. Where are you going to advertise? Your target market can help determine that – is the internet and social media right for your audience or do you need to be in magazines or on TV? Likely, a combination is the right answer. Who – who is going to do all the work associated with the “where”? You know your USP, you know where the message is best disseminated, but do you have the time, talent and temperament to create the best message, develop the brand, buy the media, navigate social, mobile and online advertising opportunities, maintain your blog, website and social accounts? Marketing success requires a plan, a division of labor and accountability. So, the next time you have the opportunity to get in the car and leave your email, texting and other distractions at the last McDonalds exit – give your business some serious windshield time and see what you come up with for your What, Where and Who. Your business, your staff, your clients and your bottom line will all be appreciative! During the past few years, kitchen and bath showroom owners have slashed marketing budgets, put a hold on advertising and have retreated to the antiquated justification “I don’t need to market; I get all my clients from referrals” – but who can blame them (you), when the option is rent and electric or media and SEO – although logic may try to push you in one direction, rent and electric tend to win out. Speaking with dozens of kitchen and bath pros each week gives us a fairly accurate reading of the state of the industry nationally. We have found that as the economic pace picks up, professionals get looser with their marketing budgets. We fielded a lot of calls in April and May when things were looking bright, but as the market tightened in June, as it traditionally does, people pulled back; afraid to pull the trigger, afraid that the client would walk, afraid of another economic collapse. But as President Roosevelt once said, “…the only thing we have to fear is fear itself”. So here are 5 reasons to fight the fear and begin your integrated marketing and branding campaign – today. Chart Your Own Future: Don’t wait for the government to “fix” the economy. We have seen that as long as there is a divided DC, neither side has the opportunity to prove their recovery plan will work. It is what it is, the new reality – adapt your messaging, branding and marketing to it. Are You Still in Business? So many of your peers are gone… shuttered… gone fishin’… outta here! Advertising lets your customers know you’re open and ready to help with their remodeling projects. Don’t be afraid to use the mass media. You’ve got a message; share it with as many people as possible. Turn Over a New Leaf: The realities of the new economy may persuade you to change your business, your message or your target market. Perhaps a move toward value and away from opulence, the low price leader, “kitchens in a box” or something in the opposite direction? Once you determine it internally, you gotta let your customers know too. It’s a great time to rebrand your business. Steal Market Share: From the “did you know” department… prior to the great depression (1930s), most people had never heard of Kellogg’s cereals. Post cereal was the market leader. They cut advertising, while Kellogg’s increased theirs – 80 years later, Kellogg’s still has a better market share. Chevy has a similar story, taking market share from Ford as result of aggressive advertising in the 30s. Plan to Spend Wisely: 2014 is arriving sooner than you think. October and November are the optimum planning months for the following year. A well-researched and executed integrated marketing plan will save you money and generate a greater return on your investment. It is your GPS to increased customers and sales. Call me this week 919-932-4600 to discuss your business and we can help you get started on a successful Q4 and 2014! This article was provided by Jeremiah Erasga is a Freelance Interior Designer with a diploma in architecture. Your kitchen is not just the area where you do your food prep. It is also one of the areas where families spend the most time. In this article, we will discuss why tile experts recommend thin-set ceramic tiles if you want to create a backsplash in kitchen. First, let us describe thin-set tiles. These tiles are tiles made of cement, finely graded sand, and a water-retention compound that allows the cement to properly hydrate. They are designed to be typically not greater than 3/16″ thick. Thin-set tiles also provide structural support so that very minor adjustments in height can be made. Water can be everywhere in the kitchen from the food or drinks you take in and use as ingredients for your meals to rinsing dishes in the faucet or dishwasher. Also, when there are changes in temperature, you can hardly escape from moist in the kitchen area. By having thin-set glass mosaic tiles for your kitchen backsplash, you can be rest assured that the tiles will not return to a liquefied state. Because thin-set tiles are not organic, they would not be a food source for the growth and formation of molds. If you are designing your kitchen for the first time or considering reinventing the tiles in the space, thin-set tiles are good investments because they do not have a prolonged contact with water. Although the material is not water-proof; it is not soluble to water anyway. Offering high flexibility and adhesion, thin-sets are a cement type of material that dries out easily. The back wall cannot be cracked when infiltrated with water. Also, selecting the thin-set for your tile installation will strengthen your wall and hence add years of life to the backsplash. Think elegance and glamor when modeling your kitchen then incorporate thin-set tiles for the backsplash. This can give your kitchen a refreshed look. With unique materials, the texture, finishes and design of your chosen tiles will be enhanced and so you can further draw distinction to any wall. The same can actually be used for the flooring. Thin-set tiles will stick out only about a quarter-inch and they do not have to be too apparent. The outcome does not have to be too monochromatic or dull either. As a tip, you can highlight the backsplash by using low lighting in the kitchen and create a modern look. Serving as a backdrop in your kitchen, the thin-set tiles can provide a warm accent to a rather dry design of the area. These would look stunning and you do not need to worry much about the design and plain looks of other pieces of furniture, cabinetry and countertops in the kitchen because you already have the tiles as focal point. The next thing to do is to find complementary materials that would create a more harmonious look and feel in the room. These accents form into a classic beauty that you will fall in love with. Tile experts must care about maintenance of tiles and this is why most recommend using thin-set tiles. Thin-set materials make the tiles more resistant to stains, therefore you do not need to clean or brush the tiles hard to remove dirt and scums. Maintenance would be free from hassles. When cleaning, the attention should only be on the porosity of the material. Regular cleaning is also a must to avoid stubborn stains from accumulating and cause damage. A good practice is to clean every day by spraying your kitchen tiles with a mixture of baking soda and water to soften the dirt first and remove them from being stuck on the walls. Once done, gently wipe with a clean, soft sponge or cloth. The use of thin-sets is now becoming more popular both in the kitchen and bathroom. Thin-set makes a room more charming before the installation of tiles like ceramic, stone or glass mosaic especially when the tile sheets are applied in such a way that they connect to the floor. This creates a connection that’s noticeable by household members and guests in a positive light. Choose good backsplash colors and designs to fit the floor tiling to achieve a grand effect. Make sure to also selecting the proper thin-set mortar as this is essential to the shelf life and quality of the tiles you will use for your kitchen backsplashes. Jeremiah Erasga is a Freelance Interior Designer with a diploma in architecture and a ridiculously high score in Plants vs. Zombies. When he’s not busy transforming simple houses into special homes, Jeremiah is in the great outdoors burning hours and calories away with endless running and cycling. Follow his journey on Twitter and Google+.